Any venue, large or small will be transformed by elegant lighting, creating the perfect mood and atmosphere for your event. We can light the whole room, or just the dance floor area.High powered LED lighting fixtures are even visible in daylight! With having the NEWEST technology in Lighting we can customize thousands of different colors to be sure to match your color scheme. With our custom light show we can program your entire ballroom to have one single color throughout the room, or alternating colors, or even a random assortment. We utilize only the most professional and up to date sound equipment, also have backup system just in case, for your peace of mind. Offering the largest variety of quality musical selections in the industry….from every type of music from every area- you name it we have it. Our services include an experienced, professional Disc Jockey, Coordinator, & MC with years of experience. 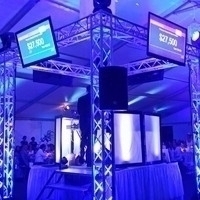 We want your event to be a memorable occasion, and will treat it with respect and care while providing special touches that go far beyond that of any other disc jockey company.